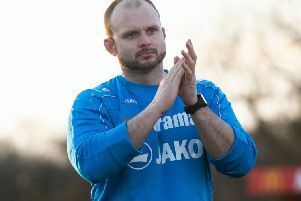 Hemel Town manager Dean Brennan was delighted by his side’s victory over Concord Rangers, but insists he won’t be getting carried away with the result just yet. The Tudors are through to the last-16 of the competition for the first time, courtesy of an excellent day’s work from forwards Oliver Hawkins and Dennis Oli, in particular. “It was a really good performance from the players; they stuck to the game plan as we played a very aggressive pressing game,” said Brennan. “It’s good to see two centre-forwards scoring and creating goals for each other. At the time the Gazette went to press, Hemel were gearing up for a clash with a young Hornets side in the Herts Senior Cup. Brennan said: “I watched Watford U21s beat Leeds United 6-1 last week, so I know a little about them. Next up for the Tudors is a league clash with Farnborough, and Brennan added: “Farnborough have been recruiting a lot of players of late; it’s going take a little time for them to gel. “They a very honest and hard-working team with a real goal threat up front with the boy Louie Theophanous who has scored regularly this season.